Chinpei has vast technical background in robotic system, multibody dynamics, advanced manufacturing, machine software, control engineering, electro-hydraulic-mechanical system integration, and human augmented/operator-less system. Chinpei’s doctoral work at University at Buffalo was in the area of robotics and mechatronics understanding the mechanical interaction of multiple cooperative ground and aerial robots. He extended his work in teleoperation and collision avoidance during his post-doctoral work at University of Texas at Dallas. Chinpei also worked as a summer researcher at the Air Force Research Lab, modeling and experimentally validated the flexible micro-aerial-vehicle wing spar structure. At Caterpillar, Chinpei programmed various advanced automation functions on sophisticated blast-hole rotary drills to progressively abstract the human-machine interactions. The goal is reduce operator fatigue by allowing machines to perform the lower level machine functions, while the operator focus on high level mine planning and/or exceptional handling. Towards the end of career at Caterpillar, Chinpei expanded his responsibility in the system level (multi-body, hydraulics and pneumatic systems) performance and control analysis of all the surface rock drills (rotary and track drills) products Caterpillar offers. Currently at Magna International, Chinpei is responsible in creating the advanced robotic software and integration roadmap to significantly advance Magna’s next generation smart manufacturing technology through utilization of advanced machine vision, tactile perception, grasping, artificial intelligence and sensor fusion technologies. 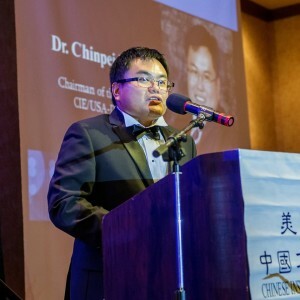 In 2014, Chinpei was the president of the active Chinese Institute of Engineers/USA – Dallas/Forth Worth Chapter. His team raise more than $80,000 in sponsorship and donations, and ran more than 15 high quality youth, young professional and professional programs benefiting more than 5000 individuals in the DFW metroplex. He is a currently a life member and on the advisory board of the organization. Chinpei published more than 30 conference, journal, book articles and patents, and continued to be a paper reviewer and associate editor of international robotic conferences. Chinpei loves to travel and taking a lot of scenic photos. He is also a technology enthusiastic, and closely following the recent development of smart devices, autonomy, internet of things, machine learning and (big) data sciences.